Standing around the altar are, from left, Sisters Luisa Campos, OP, Carol Gross, OP, Lorraine Réaume, OP, Tarianne DeYonker, OP, Attracta Kelly, OP, Rosa Monique Peña, OP and Corinne Sanders, OP. 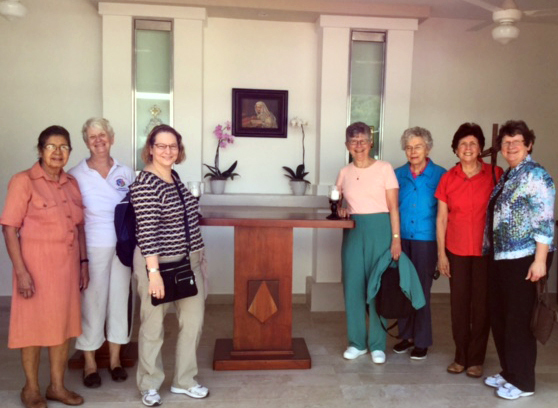 February 5, 2016, Santo Domingo, Dominican Republic – In the midst of Santo Domingo, the bustling capital of the Dominican Republic, women in discernment, women in formation, and Adrian Dominican Sisters and Associates, and all who seek God can find a haven of peace, community, discernment, and reflection. That place is Convento Santa Catalina, the Congregation’s new house of discernment and formation in the Dominican Republic. The 100-year-old renovated house was officially blessed and dedicated on January 29 and 30, beginning with a special blessing of the rooms and entryways. Sister Attracta Kelly, OP, Prioress of the Congregation, also installed a relic of 14th-century Dominican mystic, St. Catherine of Siena – for whom the house was named – into a special reliquary in the house’s chapel, or oratorio. Adrian Dominican Sister Rosa Monique Peña, OP, Director of Formation for the Dominican Republic, said she is especially excited about this unique relic of St. Catherine of Siena. “[St. Catherine] prayed in a little oratorio in her house, very small, and she decided to come to our little oratorio, very small,” she noted. Also participating in the event were Sister Carol Gross, OP, who also lives in the house with Sister Rosa Monique and shares in the ministry; Sisters Luisa Campos, Eneida Santiago, Nery (Luchy) Sori, and Basilia De la Cruz, who minister in the Dominican Republic; Sisters Tarianne DeYonker and Corinne Sanders, of the General Council; Sister Lorraine Réaume, Director of Formation; three women who helped to renovate the convent; and a group of local Adrian Dominican Associates, along with Associate Tibi Ellis, who had obtained the relic. Convento Santa Catalina will also be a house of hospitality for women in discernment, where they can experience religious life, as well as a place where women in formation and Sisters who minister outside of the capital can stay when they’re in Santo Domingo. “We hope that it’s going to be a place where people can come together to know more about their faith and to develop their spiritual life,” Sister Rosa Monique said. “What that means is that we hope to have workshops, some retreats, days of reflection and some courses that would help them develop their own spirituality.” Sister Carol, a spiritual director, has already been meeting at the convent with people she directs. The house has been renovated to allow for such gatherings. The main room – furnished predominantly with rockers and chairs – is largely an open space that can easily accommodate 20 to 30 people. Sister Rosa Monique said people have already approached her, asking about the possibility of using the convent as a site for a talk or an evening of reflection. During the second week in February, she hopes to host the first evening of reflection. But the exact use of the convent in coming months has yet to be determined. “I’m letting the activities and requests tell me how to develop the ministry down the road,” she said.